Home » Daily Post » Historical » India Has Always Killed Minorities Including The SIKHS. People who have accepted slavery and the identity of a long-haired Hindus will be celebrating the Indian Independence Day today. 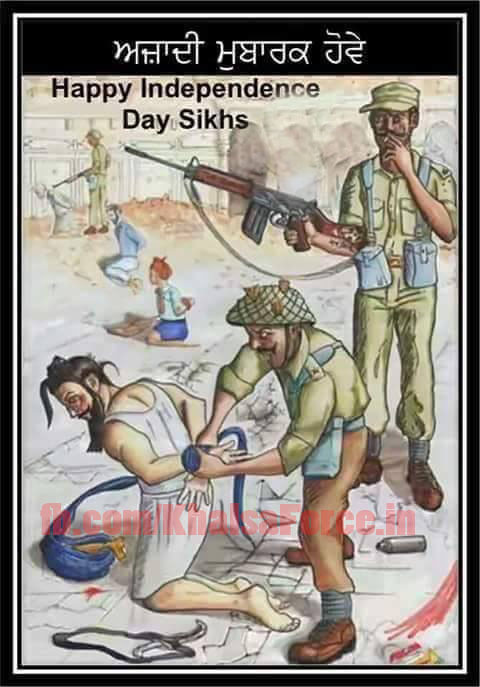 The reality is, before 15th August 1947 the Sikhs were slaves under the British Rule, but after became the slaves of Hindu Rule and to top that up, the Sikhs also lost their identity under the Hindu Rule. Facebook shows me that today is ”Independence Day”. So i wish to write up on this so called Independence ! Jinnah wanted Pakistan till Gurgaon. Punjab was a Muslim majority state hence Muslim League wanted ENTIRE Punjab to be a part of Pakistan. When Flag of Pakistan was hoisted on Lahore Assembly, Master Tara Singh tore it down with his Kirpan. Akalis refused to let entire Punjab go in Pakistan. Tough stand by Akali leaders at this point didnt let whole Punjab go in Pakistan. Then, First border was drawn at Jehlum river. Jehlum as border would have given entire Lahore, Layalpur, Multan, Nankana Sahib to Eastern Punjab. ML refused to this proposal. Then the border was moved to Chenab. Chenab as border would have still been beneficial for Sikhs as Sikhs would not have had to leave their ancestral Lands, properties and Gurudwaras. Muslim League refused to this agreement too and Riots started. Under pressure of Jinnah and with tacit approval of Nehru-Patel and Mohandas Gandi, border was marked at River Raavi. Akalis were all alone in this process. Muslim League had support of millions of Muslims and even British Officers were siding with them. Congress was least bothered about Punjabis. It had HINDI HEARTLAND intact. They did not care if Sikhs lost everything. Pakistan got Punjab till Raavi and millions of Sikhs had to migrate to eastern Punjab. More than 250,000 of them were killed. I have many stories of Partition which i have collected from buzurgs of my Paternal and Maternal sides, stories of Pain and separation and stories of Valour and Sacrifice !! If Sikhs of Lahore-Gujranwala-Multan-Rawalpindi had known that Raavi would be the Border, they would have moved much earlier and sikh casualities would have been very less. The biggest blunder was made by Akalis. They did not include Sikh states of Patiala, Nabha, Kapurthala, Jind , Kaithal etc in their discussions with British diplomats. British had a soft corner in their heart for Patiala family. Maharaja Bhupinder Singh and later his son Maharaja Yadwinder Singh had this wish to do something for Kaum. Even Baba Isher Singh had asked Akalis to ally with Rajas and we would have got a separate country from Gurgaon (then under Patiala state) till Chenab. But Akalis were much against these Royals. They formed an alliance with Congress instead of Sikh states. All in All – Muslim League of Jinnah, Congress of Gandhi Nehru and to some extent Akalis under Tara Singh and Kartar Singh were responsible for Genocide of Sikhs which happened in those couple of Months. It was NO INDEPENDENCE for SIkhs. We lost Our Gurughars, Our Sikhi’s Birthplace, Our Capital City Lahore, millions of sikh lives. Thousands of sisters and daughters were killed and raped. Thousands committed SUICIDE to save their honour. The struggle which started in 1849 to regain Khalsa Raaj continues even after 1947…… A Raaj where on one side we have Nankana Sahib and on other Patna Sahib ! !